Can I just say how much I love acorn squash? It seems so versatile and the squash flavor is so subtle as opposed to the in-your-face-flavor of the butternut squash. Can you tell I've never been a butternut squash fan?!? For me, squash and beets are a lot alike. I didn't like them as a kid, but beets I now love. I realized that was time to stop the nonsense and embrace this wonderful fall squash. 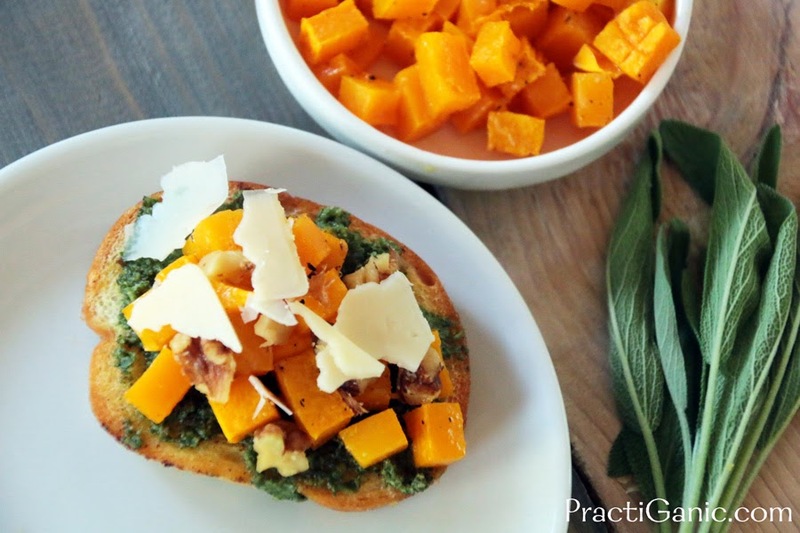 I recently found a love for sage pesto and I knew squash would be the perfect match. The appetizer was amazing! The squash tasted so good after it was roasted with a little salt and pepper, that I found myself to be munching on it when it came out of the oven. So, maybe I just don't like mashed squash with cinnamon on it. Surprise surprise, I should've known years ago that I would like it more savory than sweet! I didn't use the whole squash so the extras were great for the kids side dish for dinner that night. Maybe they will now grow up to be squash lovers! I've also made this recipe with sweet potatoes instead of the squash ... not as great, but a great substitute when you need one. **Ia have made these gluten free and vegan before using Udi's Bread and I simply omitted the cheese from the pesto and I used a vegan cheese to melt on the top. Drizzle some olive oil over your bread and sprinkle garlic powder over them. Toast bread for about 7 minutes then flip and toast another 5. I don't like mine super crispy but you don't want it soggy so it can hold the bruschetta. Keep an eye on them so they don't burn. Once toasts are out, raise oven to 375º. Drizzle a little olive oil on the squash and shake some salt and pepper on it. Bake for 20 minutes or until tender. Mix it with the walnuts. 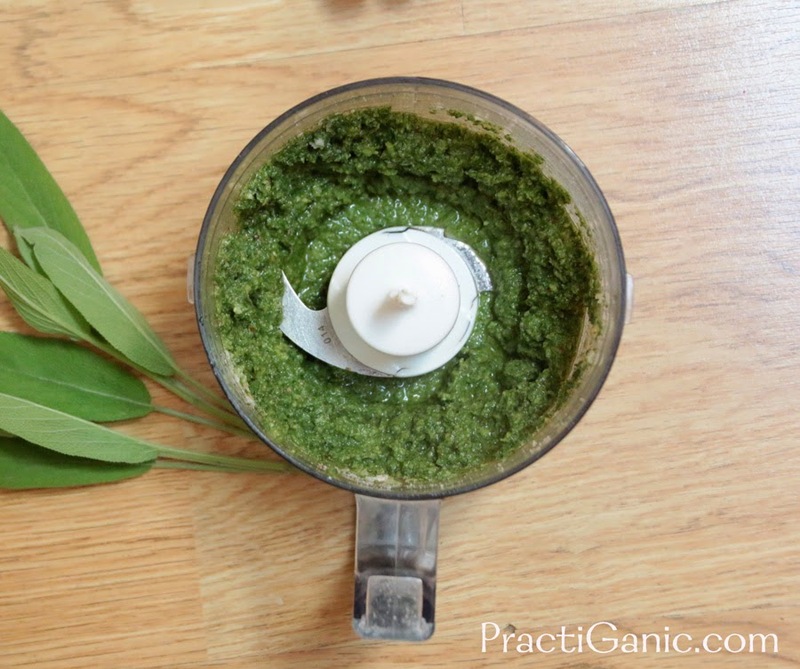 Meanwhile, make your sage pesto. 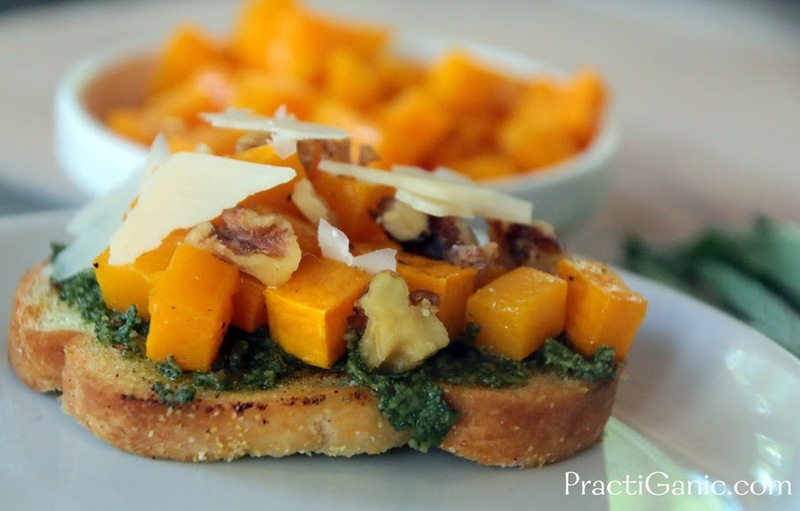 To assemble, top your toast with pesto, then squash and walnuts and then sprinkle some shaved parmesan on the top. If you want, you can put them back in the the oven so the cheese melts a bit or just serve as is! *to make vegan use Cashew Parmesan or other vegan parmesan. Put all ingredients into your food processor and mix until smooth. Add more oil if needed.